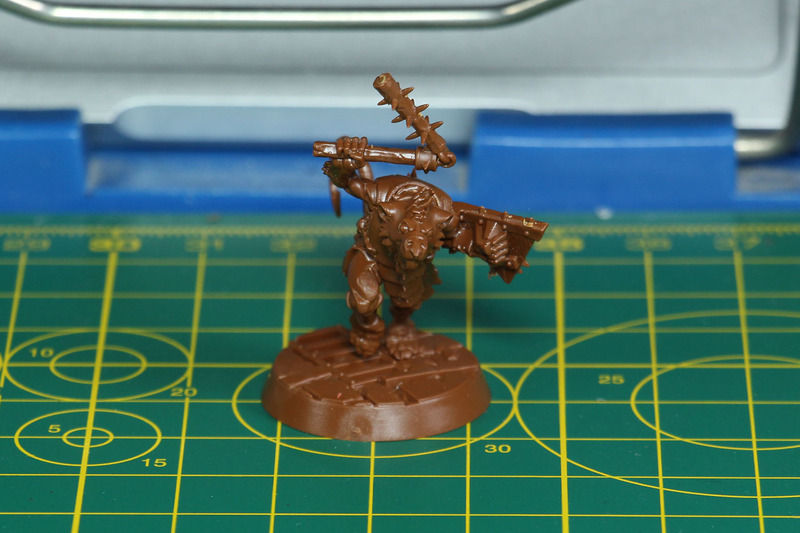 Games Workshop covers the range of Shadespire with push-fit miniatures. 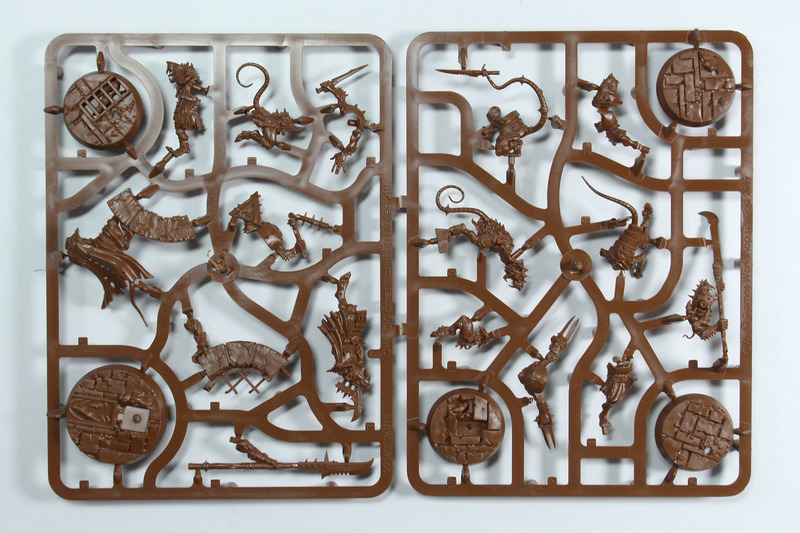 These miniatures can be assembled without the use of glue. The parts stick together by friction. 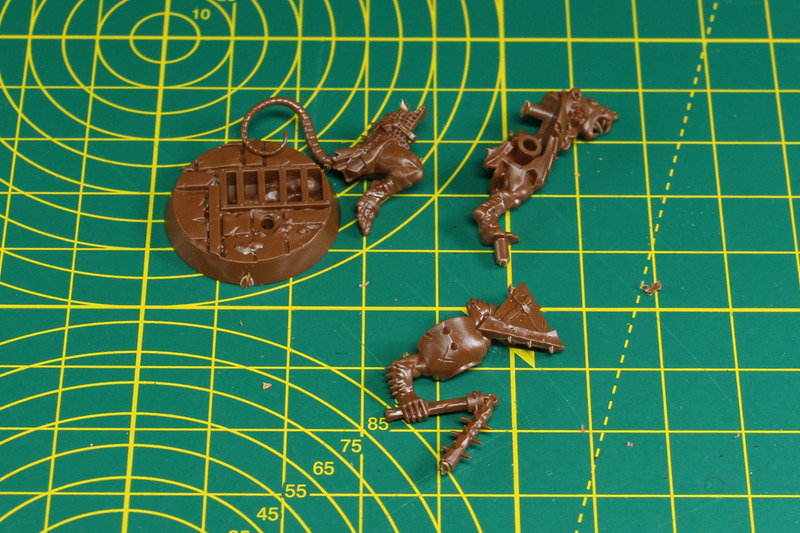 Some parts may have a very tight fit, so it might be easier to cut of the pin-socket connection and just glue it like a regular plastic kit. 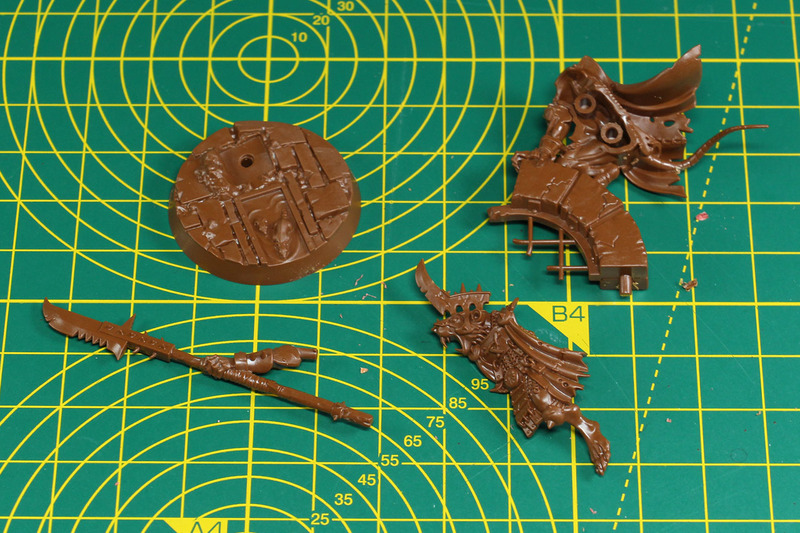 The coloured plastic can be worked with like the regular grey plastic, so it works with plastic glue, primer and colours as you know it. 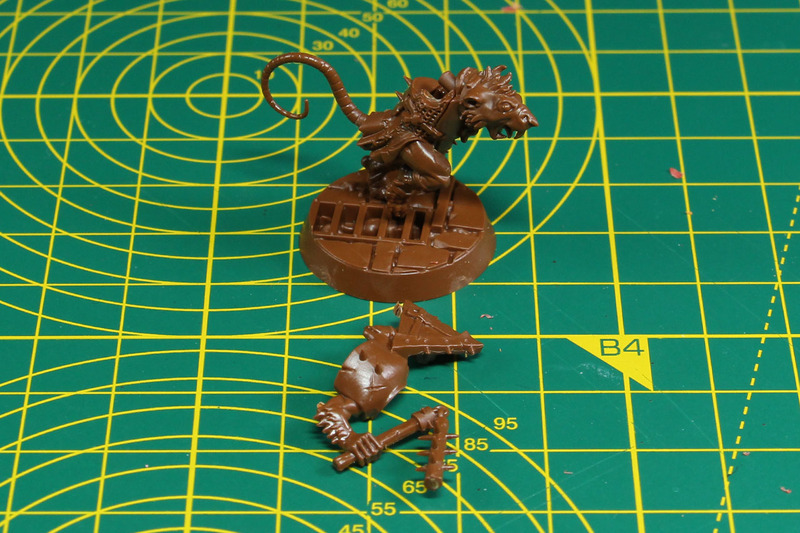 The Skaven swarm comes with pre-sculpted bases, so with them being push-fit, basically all you need to finish them is primer and paint. The quality of the cast is very good, a great amount of details and proper use of frame. 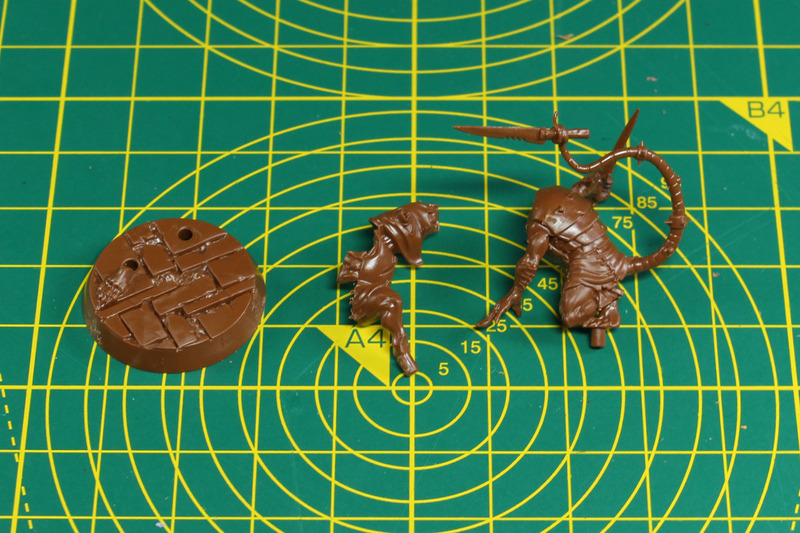 Just be careful with some of the smaller / thinner parts, like the tails or sharp points of the weapons, as they might break if you handle them without care while removing them from the sprue. A pack like this needs one to lead them. With Skaven these leaders are less of an inspiring persona, more of a demagogue who incites the rest of the group. 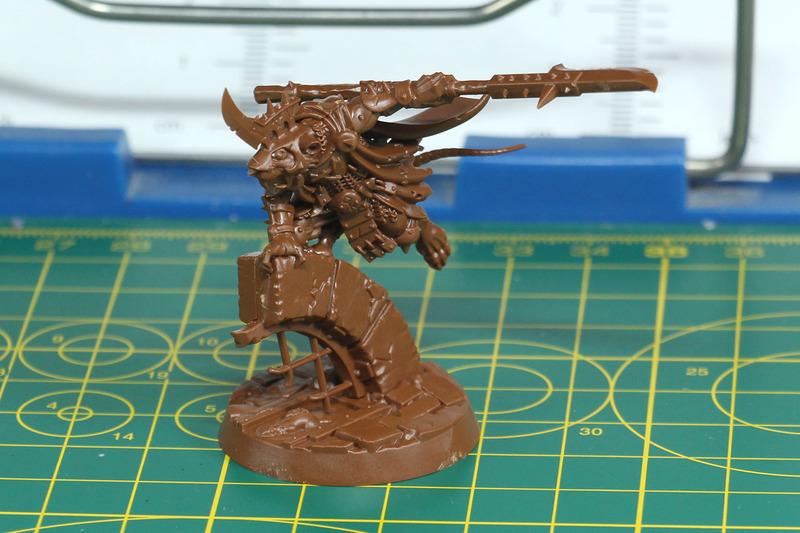 Skritch Spiteclaw has a very cool looking dynamic pose, jumping over a sunken piece of what looks like a sewer gate. 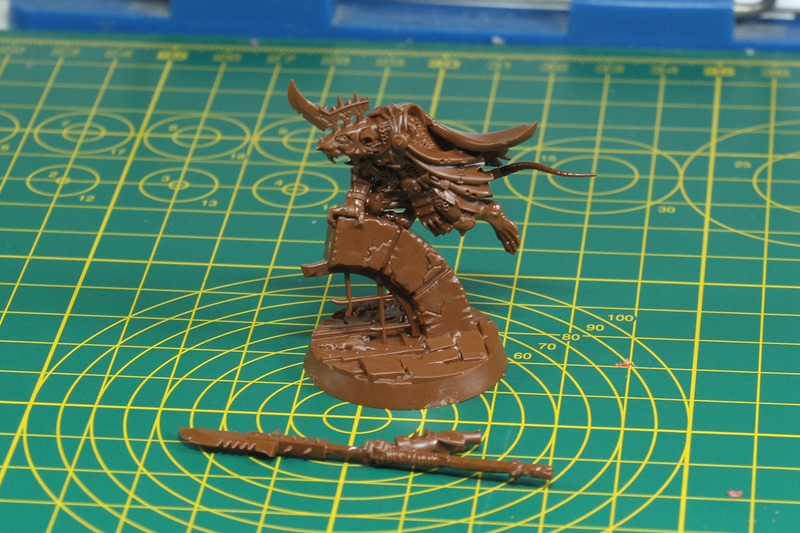 He wields a wicked halberd that is upgraded to a warp halberd once he's inspired. To inspire any miniature from this warband, you have to use a ploy on that fighter. Very true to the lore, as the Skaven race is described as back stabbing and opportunistic. 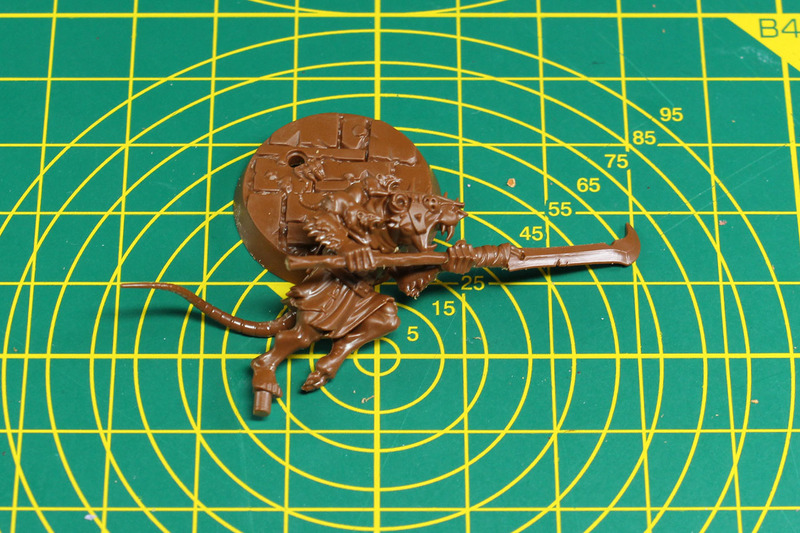 Inspiring makes the Skaven harder to hit, as they get scared and are more likely to flee. Interesting and devoted to the lore use of the inspiring upgrade, as Skaven always had special rules about their moral, as they are a cowardly race and their heroes used to be placed in the back of the regiment instead of the front. Skritch has an interesting special rule, a bit similar to the warden of the Sepulchral Guard, he can chose to use one action to "reanimate" one of the unnamed Skaven (so basically anyone but Krrk) and bring them back into the game. This is less about necromancy, but about the fact that of these vermin are always more around than you can actually see. Krrk, the Almost trusted, is what you would call among Skaven the right hand of Skritch. Usually this role is filled by an opportunist, who is only waiting for his leader to fail, so he can claim his post in the pecking order. For that reason Krrk is simply almost trusted. Krrk has a spear as a weapon, so he can attack the opponent without getting to close. He is the only one of the swarm that does not benefit with a bonus on his attack from being inspired. And he is the only one who actually parries an attack (Shield symbol for defence) instead of evading. The rat on his shoulder is a nice little detail to this miniature. 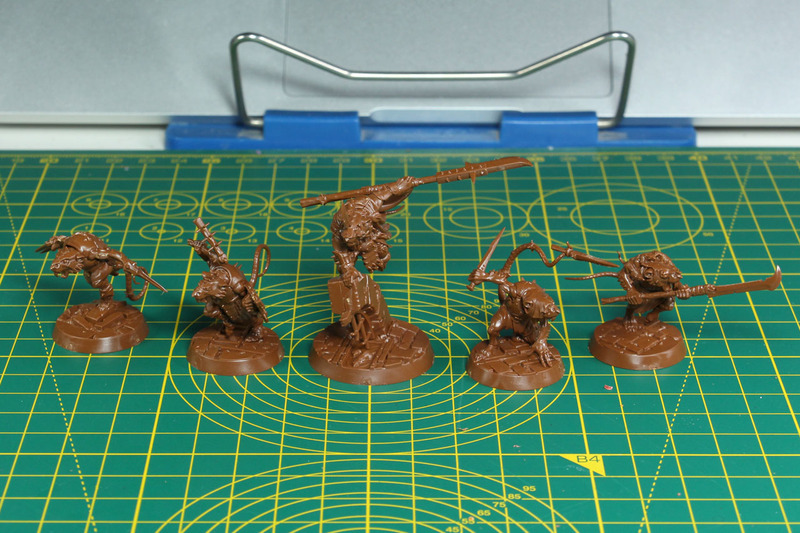 The remaining three Skaven don't have proper names, but are more called for their pose. 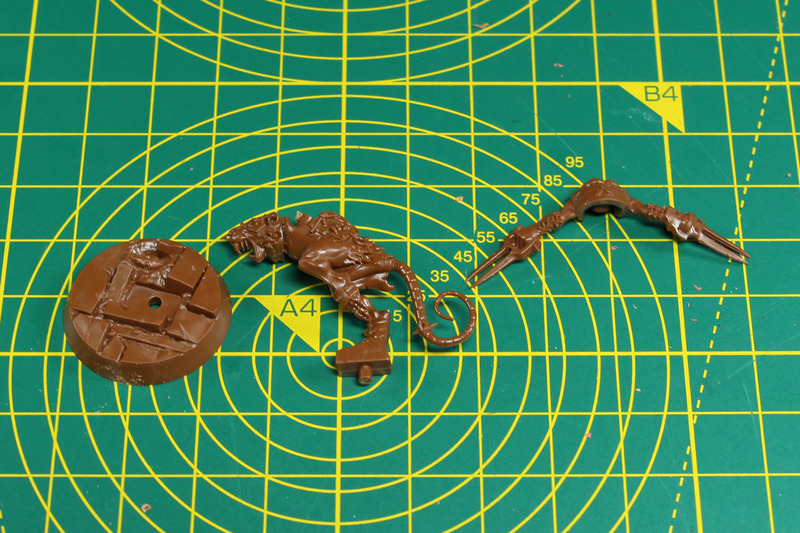 There is the Lurking Skaven armed with a pair of Katars (Punch Daggers). No special rules, gets inspired when a plot is played on him and receives an upgrade on evading and a bonus die on attacking. 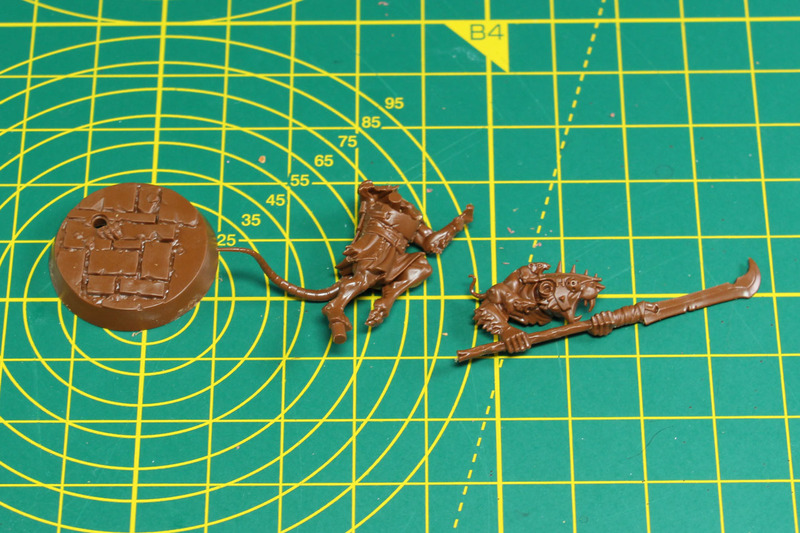 The Hungering Skaven carries a Rusty Flail with a rather unspectacular damage of one and a shield (but that is only for looks and not covered in the stat line or rules). 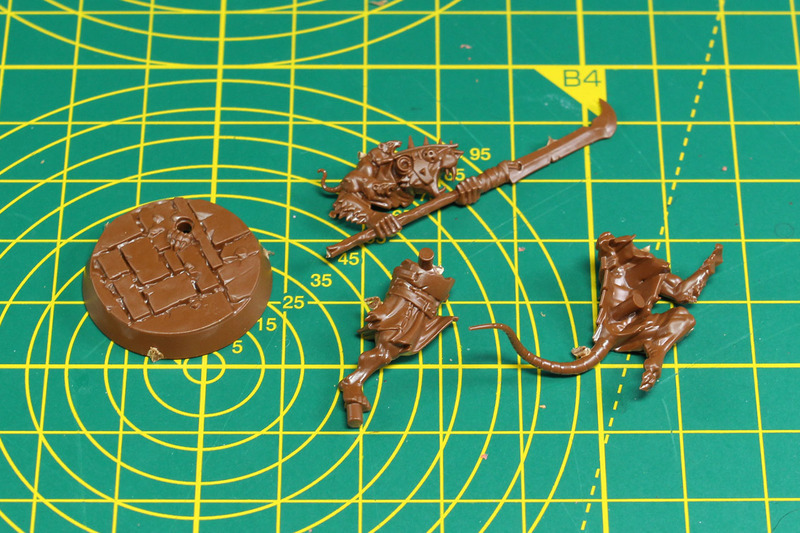 Other than that, the same rules as the Lurking Skaven. 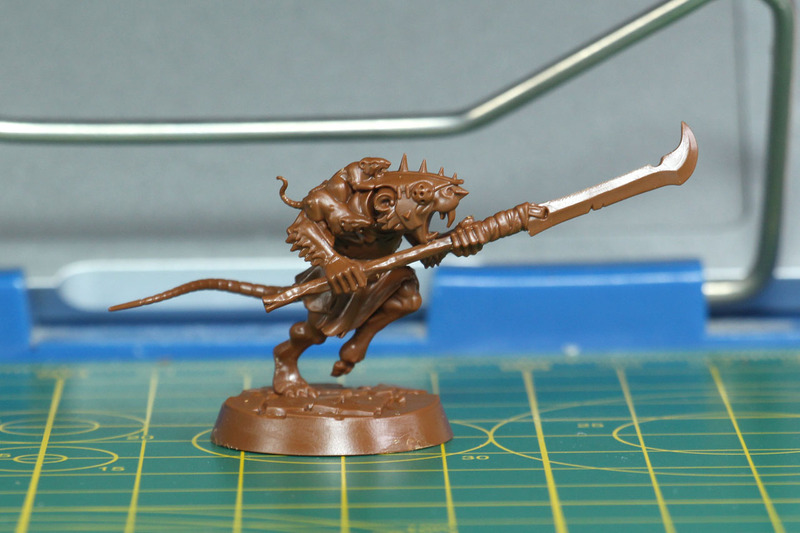 And there is the third "nameless" rat in the swarm, the Festering Skaven, has Stabbing Blades that he puts to use by using his hands and tail. He has the same rules for Inspiration as the others and receives a bonus on evading and attack die. I'm not sure if it was intended or is just a coincidence. But we have a group of 4 warriors lead by a large rat in the sewers. Could this be a Turtles-Easter egg? Skritch being Splinter and the remaining for Skaven being Leonardo, Donatello, Raphael and Michelangelo? The weaponry is not "spot-on" but still similar enough to the twin katanas, Bo, Sai and Nunchaku. At the 6th Rhein-Main-Multiversum somebody painted them accordingly and even added some small shells. I'll just leave this here to subliminal influence your choice of paint for your swarm. Skaven are among the smaller creatures of the Warhammer setting. 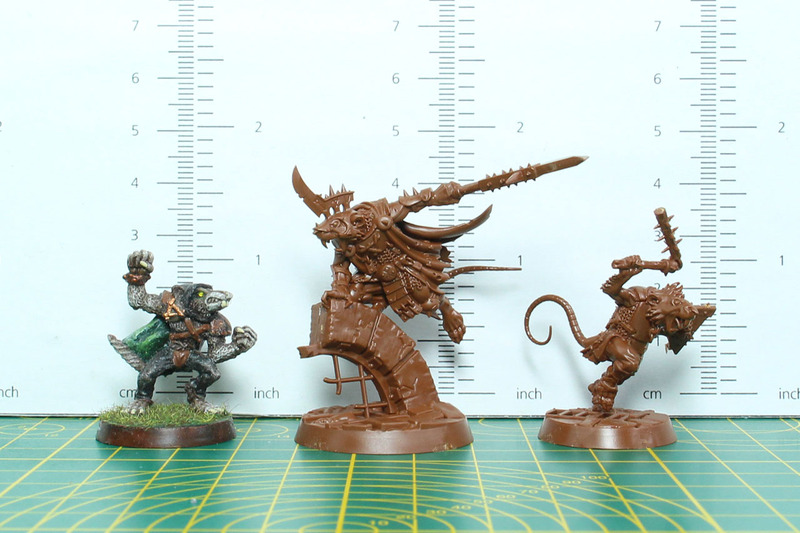 They stayed roughly the same over the years, but got sharper, leaner proportions as you can see from the comparison of one of the Blood Bowl Skaven from the mid-90s. This slender looks works much better than the old plastic kit from the late 90s / early 00s, with very hunched backs and broad shoulders. Very dynamic poses and with the long tails a good "flow" within the posture. 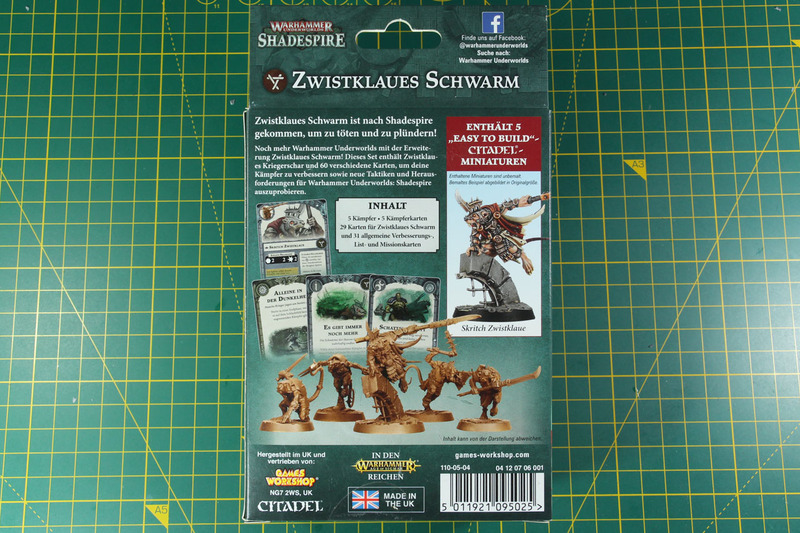 First of all, as mentioned above, similar to the Chosen Axes with their stubbornness caught pretty solid in their profiles and conditions for being inspired, the rules for the Skaven swarm is spot on true to the lore. Inspired by a plot and not making them into uber-warriors, but easier to miss is a great idea. Along with the "rat-call" of Skritch, to bring back more of the rat pack, is an interesting addition as well. And they return not just from your starting hex fields, but from any starting hex on the battlefield. The swarm is very mobile with a movement of 5 all across the warband. Therefore, you can isolate and swarm enemy warriors, something that you need to do, as they are rather unlikely to win a fight one on one. 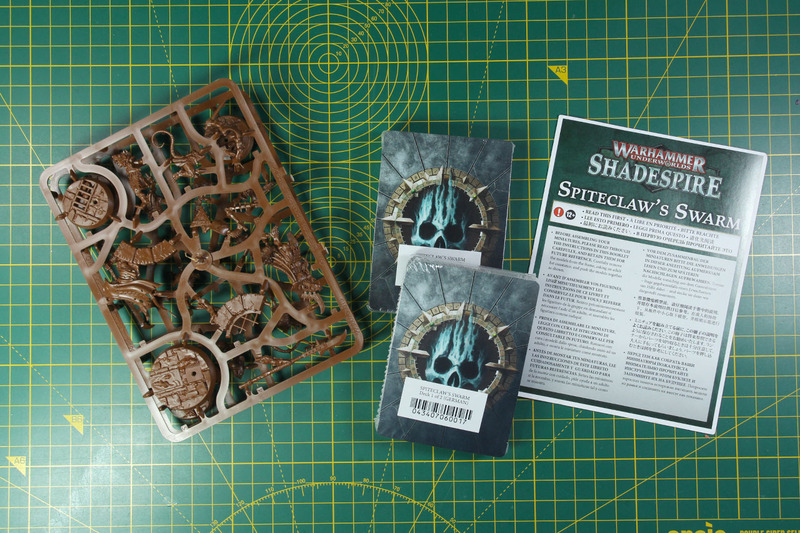 As always, Games Workshop provides several deck builds on their Underworld Community page and for Spiteclaw's Swarm there are quite impressive winning and runner up decks of several events. Some of these builds work around using the speed of the swarm to hold objectives, fall back when the enemy approaches and bring back fallen warriors in their back. In combination with denying your opponent any glory points by using cards like Expendable or There are always more, you will make the most of your swarm and are more likely to keep an upper hand. This warband has incredible potential, but do not be fooled, this comes at a price. They are rather fragile, an enemy that has some heavy hitters and gets in touch with your warband, will hurt you. So have a plan, keep a lot of the right plot cards in your deck that inspire your Skaven and make sure to not expose your leader. Skritch can deal quite some damage and with his reach of 2, you can keep the needed distance to the enemy. In combination with the matching upgrades and the movement of 5, you can fall back if the victim is about to fight back. 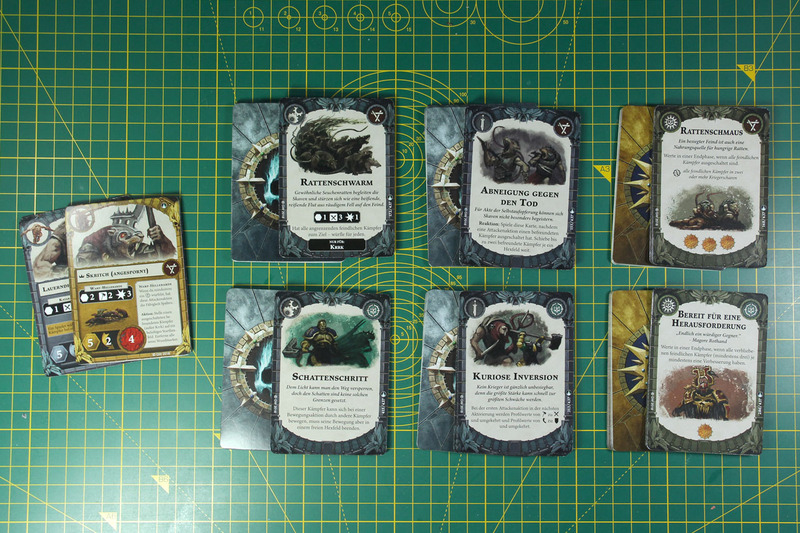 I like the way, the lore was brought into the rules for the warband. 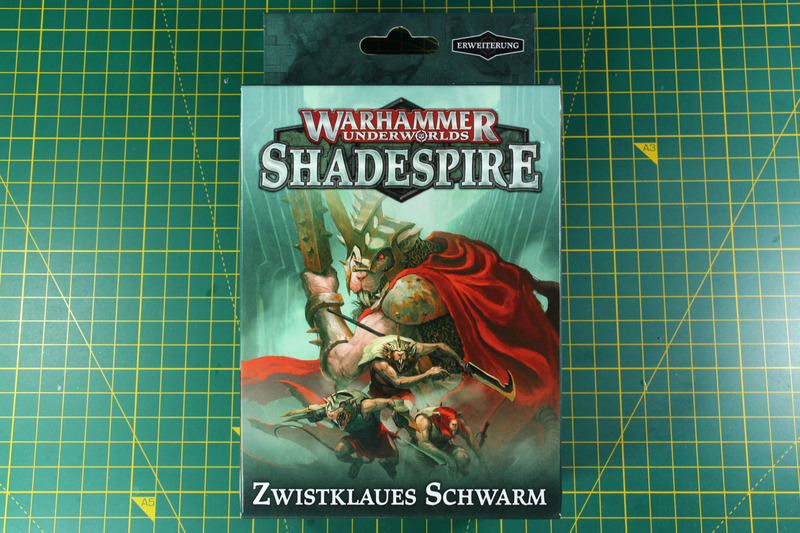 A proper combination of rules, as it is very skaven like to play a lot of plots and you are rewarded for doing so. 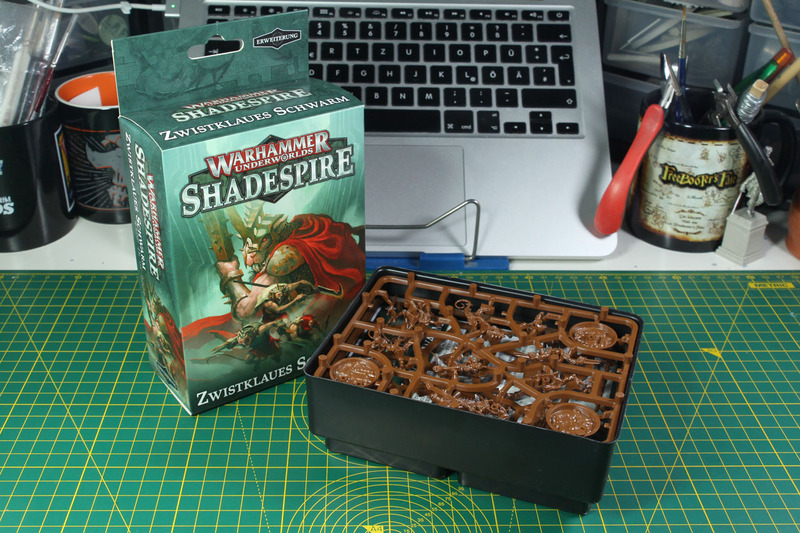 This box is of most interest for those who play Shadespire, the easy to build kit without the cards etc. 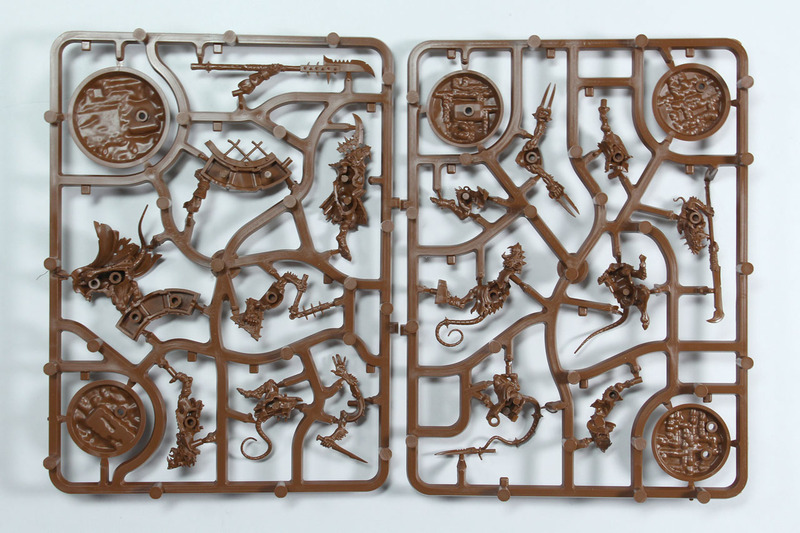 just for Age of Sigmar is at 20 EUR to expensive compared to the regular Skaven range. 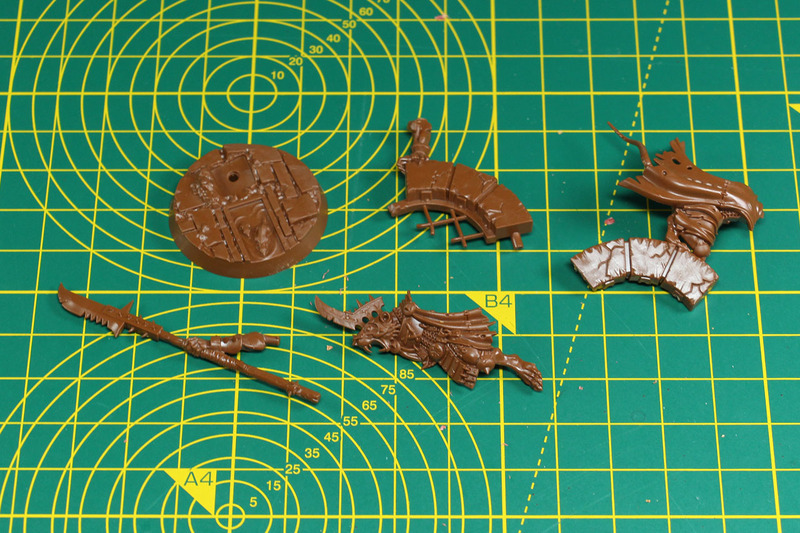 That is not really the fault of this kit, but more of the superb price-performance ratio of the regular plastic kits. 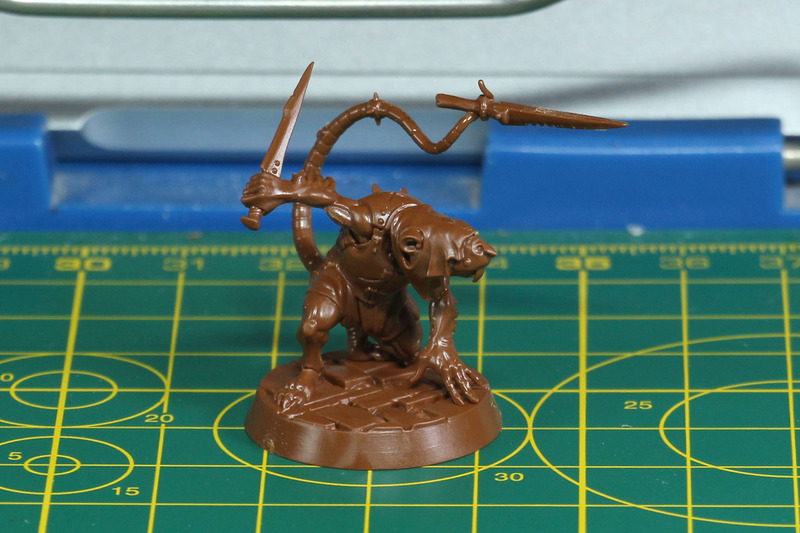 If you can buy 20 clan rats for 30 EUR or 20 storm vermin for 39 EUR, it is a bit hard to argue that 20 EUR for 5 is a good deal, even if you count in the character. 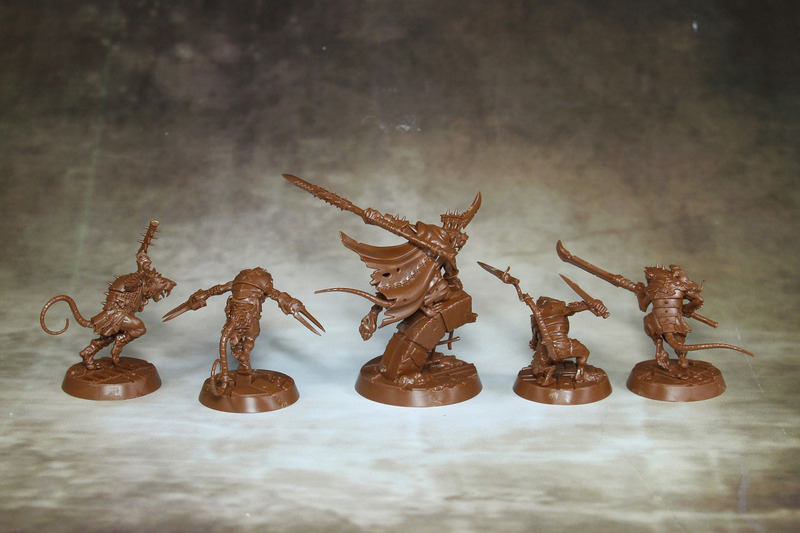 As these are not the newest, they still have the older price range of around 15 EUR, and to be honest Queek Headtaker is an amazing looking model - now simply called Skaven Warlord. 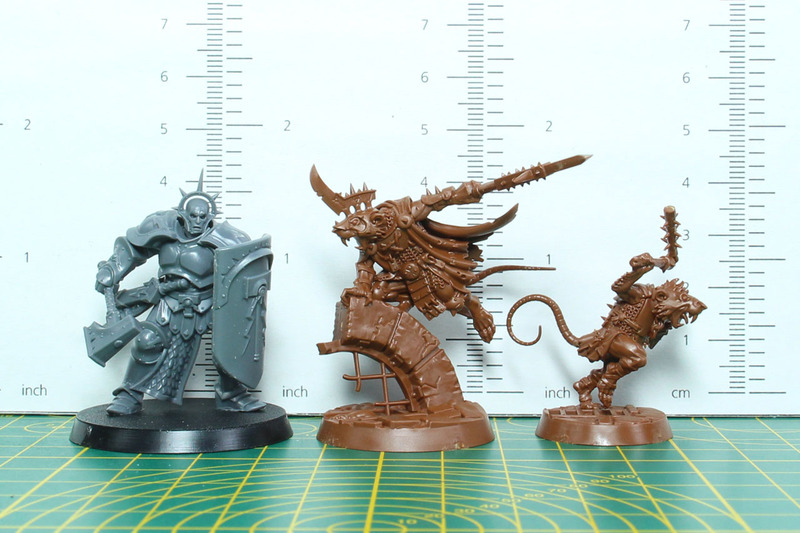 You can't say anything bad about the casting quality of these miniatures. Very crisp details on them. 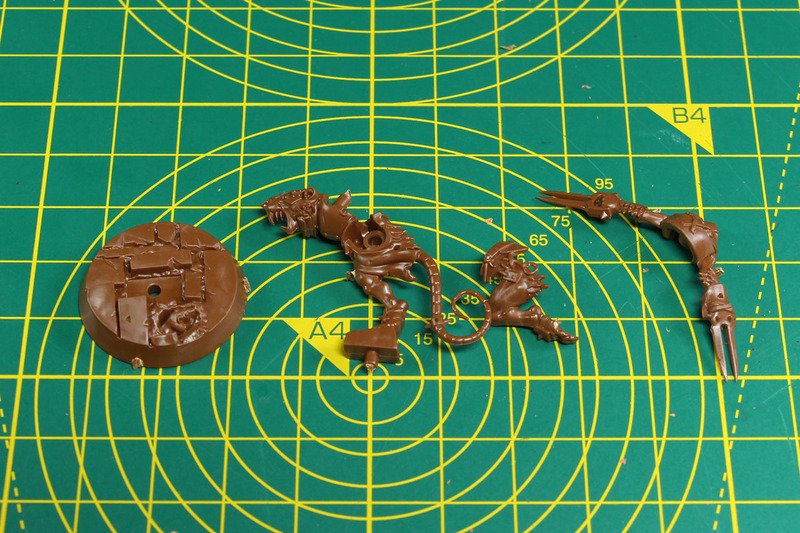 You just have to be careful while removing the parts from the sprue and during the assembly. 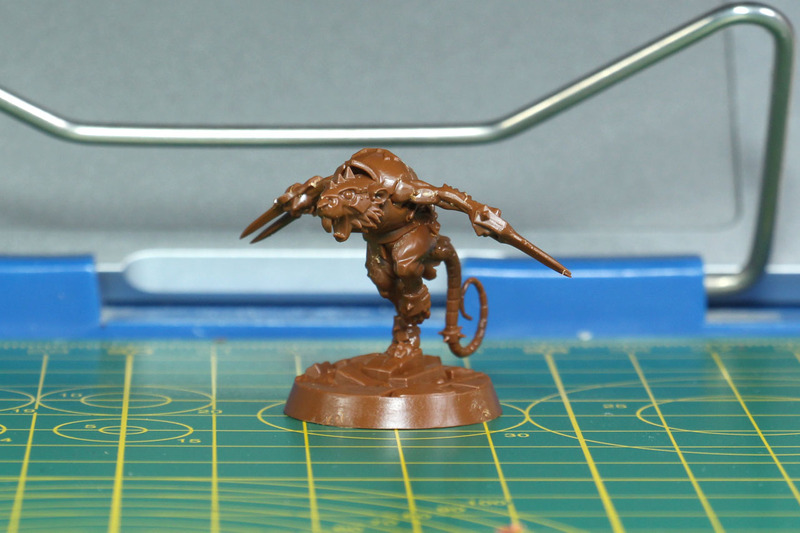 As the Skaven are so slender, so are their limbs. So if you are pushing the parts together and add pressure for the remaining half of a Millimetre of a gap, don't go over the top or you will likely break it or blunt the surface. 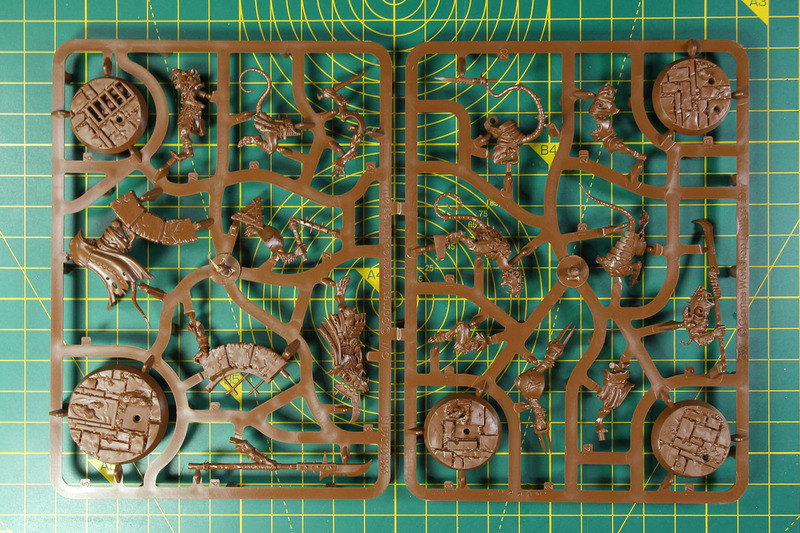 I would recommend cutting off the connection pieces and glue the parts together the old fashioned way. 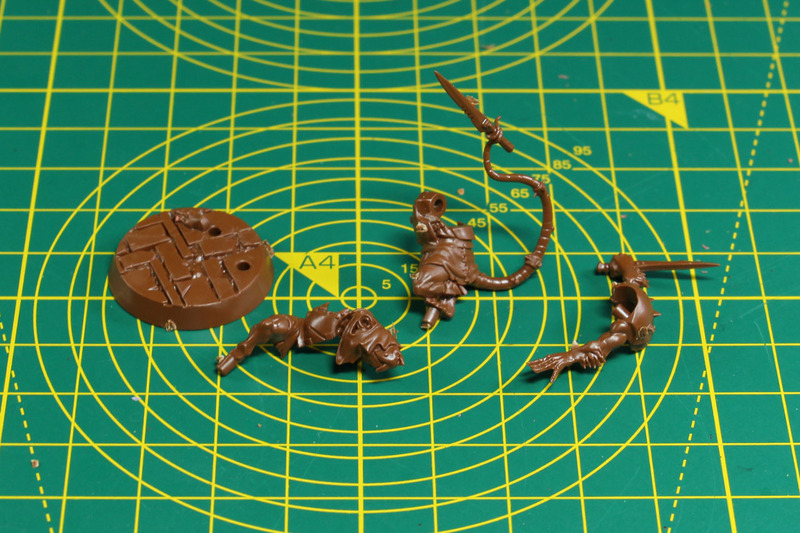 Removing the mould lines along the tails or furry arms can be a bit of work, but it is worth it to give them a clean finish and proper base for the paints. In addition to the - for my taste - well implemented rules, I really like the idea of the "Turtles-Easter egg". Skaven have a weird background, lots of comical and funny stories among them and this tongue in cheek humour is a fitting addition to that. 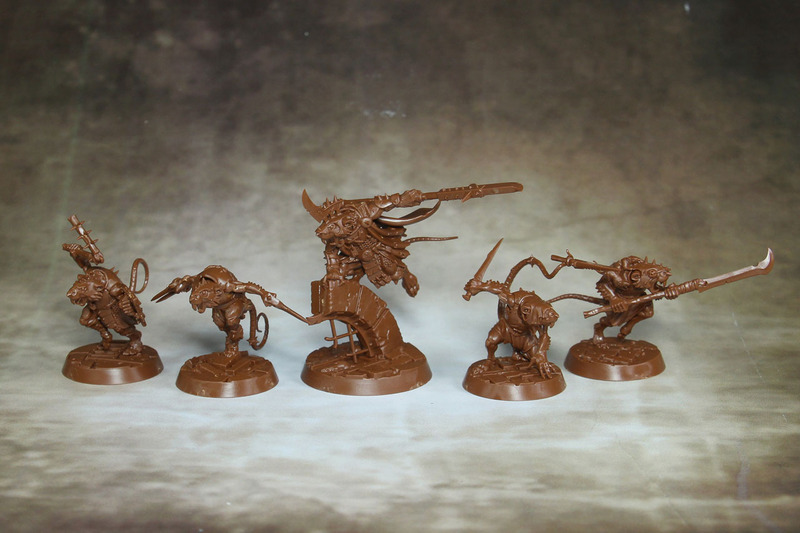 Other than that, the poses are very dynamic, well caught impression of the Skaven swarm and I really can see this war band as a good choice for either long time Warhammer lore fans and / or advanced Shadespire players.